To be a successful blogger, you must know how to use social media properly to drive traffic to your blog. Twitter is the second most popular social media, having 328 million active users monthly. So every blogger must have twitter profile for his/her blog and keep it updated with latest posts in the form on tweets. Today, we are going to share a great twitter widget for blogger blogs. This widget will surely increase your blog's presence on Twitter as this widget is cutest blogger blog which allows visitors to follow your blog and tweet the blog posts. This will fly across the webpage as the mouse cursor move. You can check the live demo of this beautiful widget on this blog post. Simply scroll up and down this page and you will see a cute twitter bird flying. So, lets start the tutorial on how you can add this beautiful twitter flying bird to your blogger blog. 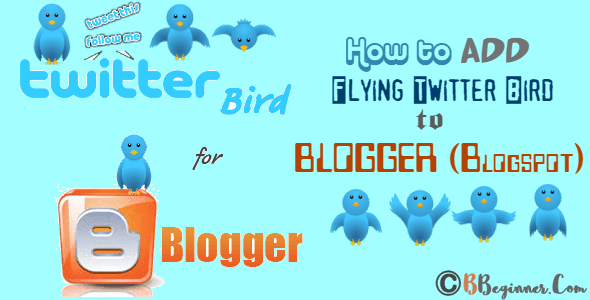 Simply follow the below steps to add this animated twitter flying bird widget to your blogspot blog. Remember to Backup your blog's template before doing any changes. Replace BBeginnerCom with your twitter username. Save the Template and You'are done! I hope you successfully added this cute widget to your blogger blog. If you still face any difficulty then let me know in comments. Also, don't forget to write your views and suggestions. helpful blog. thank you for sharing.